Bang & Olufsen to launch 46in BeoVision 10-46 TV | What Hi-Fi? 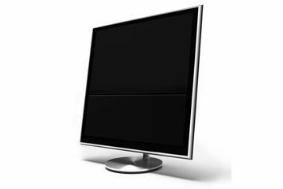 The BeoVision 10-46 will be based on an LCD panel with Edge LED backlight, as in the 10-40, and featuresthe same 200Hz panel. Noted for their audio ability, exact details for the latest screen are yet to be announced but should be similar to the existing BeoVision 10, with integrated speakers and amplification and a custom-made bass port. Priceing is yet to be announced but with the 40in model selling at around £6k, expect to have to break in to a few piggy banks.